ARM chips already power a wide swath of the world's mobile devices and an increasing number of server products, which will include those from AMD come next year. AMD announced today a public strategy and roadmap for its forthcoming server products, which includes the company's first ARM-based processor coming in 2014. Known as "Seattle," AMD aims to deliver the "industry's premier ARM server CPU," based on the ARM Cortex-A57 core, with two to four times the performance of its recent Opteron X-Series. The first 64-bit Seattle chips are expected to run eight cores at 2GHz or higher with support for 128GB DRAM, with a 16-core version to follow. AMD expects sample quantities of its Seattle chips to arrive in the first quarter of 2014, with full-scale production kicking off by the second half of the year. "AMD led the world in the transition to multicore processors and 64-bit computing, and we intend to do it again," remarked Andrew Feldman, general manager of AMD's Server Business Unit. According to Barron's, Mercury Research estimates claim Intel currently holds 95.7 percent of the server microprocessor market as of the end of 2012, a number AMD hopes to chip away at in the years to come, starting with Seattle. 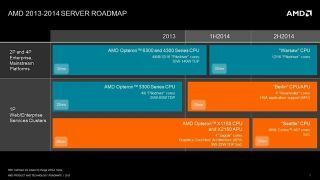 AMD's roadmap also includes a x86-based processor code-named "Berlin" and "Warsaw," an enterprise server CPU coming in the first quarter of next year. ARM's chipsets power leading devices like the Samsung Galaxy S4 smartphone, Microsoft Surface RT and Amazon Kindle Fire HD tablets as well as Samsung's low-cost Chromebook Series 3. While we tried to glean more from AMD what the future holds for it and ARM, the company deferred to its statement. We don't think, however, that today's announcement is the last we'll hear about what AMD and ARM plan to do together. Discover more about what ARM is learning from the competition.